Supporting the project’s energy-efficient and environmentally responsible operations, Wausau Window and Wall Systems’ curtainwall, windows and sun shades balance natural light and comfortable interiors. New College House’s large, vertical transparent towers feature Wausau’s products and frame the views of Penn’s surrounding campus community and Center City Philadelphia. Bounded by Woodland Walk and 34th and Chestnut streets, the seven-story building with a publicly accessible, lifted lawn serves as a pedestrian gateway to campus. Under INTECH’s guidance, National Glass & Metal served as the glazing contractor and collaborated with Wausau to meet the numerous design and performance requirements of New College House. The project team selected Wausau’s SuperWall™ system, 4250i-OS INvent™ Series fixed and projected windows, and ClearStory™ sun shades. National Glass & Metal installed more than 39,000 square feet of SuperWall in three frame depths – 4.75, 6.25 and 10.25 inches. Wausau supports local control of scope of work, project management and approval as facilitated by its knowledgeable team and engineering tools. 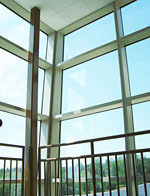 Within the SuperWall system, National Glass & Metal incorporated Wausau’s 4250-Z zero sightline insert vents. These operable units allow for natural ventilation, which provides a seasonal opportunity for fresh air and reduced demand on air conditioning. The 3,950 lineal feet of custom-engineered ClearStory sun shades also optimize energy performance and thermal comfort by controlling solar heat gain, managing visible light transmittance and maximizing natural daylighting, all while preserving outside views. To match the look of other student residences on campus, more than 400 offset INvent windows are installed at angles to the red brick and limestone façade of New College House. These windows include a combination of operable and fixed units with matching sightlines. Adding visual interest, the glass plane is recessed 1.25 inches from its exterior face. Enhancing the units’ performance, the 4.5-inch aluminum frame is fabricated with a polyamide thermal barrier. Linetec provides the thermal improvement services for Wausau’s products, as well as the painted finishes. On the windows, a Dove Gray color was specified. On the curtainwall and sun shades, a custom Gettysburg Metallic color was used. All of these aluminum components were finished in a three-coat, 70 percent polyvinylidene fluoride (PVDF) resin based, liquid paint. Applied under Linetec’s stringent factory-controlled processes, these finishes meet the American Architectural Manufacturers Association’s (AAMA) 2605 industry standard, as well as minimize buildings’ maintenance costs and maximize long lifecycles. Further contributing to the project’s sustainability goals, the aluminum used to produce Wausau’s curtainwall and window systems is a high recycled-content aluminum billet composition. In addition to its high-performance curtainwall, sun shade and window systems, New College House’s other sustainable design features include its green roofs, low-flow plumbing fixtures, high-efficiency lighting fixtures and energy recovery units. Within its interior are comfortable single student rooms collected in three- to six-person suites, with access to study areas, a media center, open communal spaces, seminar rooms, a dining café and an enclosed courtyard. “The building delights on so many levels—its marvelous integration of public and private open space, its sophisticated approach to fostering communities at multiple levels, its integration with the urban fabric, its deft use of materials, its craftsmanship, and, in particular, its assured manipulation of scale, which breaks down what is actually an enormous building into multiple integrated parts at human scale,” describes David Hollenberg, University Architect.